AVA contributed to the Urban Design Studies for the Harbor Subdivision Transit Corridor, including the study and preparation of reports on Urban Design Concepts and Elements, Station Area Planning Issues, and the Assessment of Transit-Oriented Development Opportunities. AVA also coordinated a series of meetings with cities through which the proposed alignment is to run, in order to learn how the project might best benefit these communities. With the knowledge gained, AVA prepared Urban Design and Station Area Planning concepts to be used by Metro in larger scale public meetings. The Harbor Subdivision Transit Corridor is a Metro-owned rail and right-of-way currently operated as a freight line. Metro was interested in implementing passenger transit service on this line, and to expand the corridor beyond the Metro-owned portions. 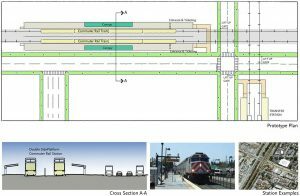 An Alternatives Analysis to study Transportation Planning and Urban Design issues was undertaken, through which an alignment and recommended station locations were determined.